Damian Draghici is a Romanian pan flute performer, famous for his triple-tongue staccato technique that allows him to play three times faster than the average pan flutist. He is known worldwide as “The Speed of Light”. 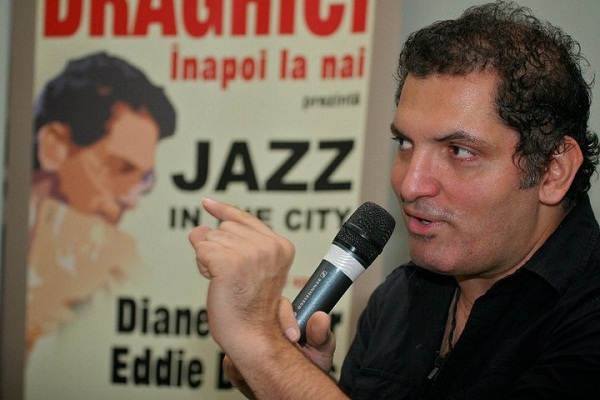 Damian Draghici was born in 1970 in Bucharest, Romania, in a family with a tradition in music for over seven generations. He played different instruments since the age of three, but in the end he took up the pan flute. By the age of ten, he had won the first prize of the Romania National Music Contest for five times in a row. At 14, he was performing live on TV the G major Concert for Flute by W.A. Mozart and Suite in B minor for Flute, by J.S.Bach. In 1988, he applied for a visa, but his request was refused by the Ceausescu regime, and the musician clandestinely left Romania in 1989. At the age 18 he was accepted for a scholarship at the Berkeley College of Music in Boston, United States and he succeeded to complete a four-year degree in a year and half, graduating in 1998. He became the first pan flute player in the history of music, holding a Bachelor of Music degree on this instrument. He is know for his unique technique which enables him to play the pan flute three times faster than the average pan flutist; this is why he earned the nickname “Speed of Light”. He is also the only artist who can play G major diatonic instrument chromatically in all twelve keys. His music combines rock, jazz, electronic, gypsy, classical, hip-hop and Spanish Flamenco. He played with famous musicians such as Paul Winter, Howard Levy, Glen Velez, Gary Thomas, Eugene Friesen, Randy Crafton, John Lockwood and orchestras from around the world including London Philharmonic Orchestra and New York’s Festival Orchestra. In partnership with Hans Zimmer he composed the soundtrack of the famous trilogy “Pirates of the Caribbean”. His discography includes albums such as Romanian Gypsy Pan Flute Virtuoso (1999), United States Yale Strom: Garden of Yidn (2001), Oneness, Damian’s Fire (2004), Damian Draghici Brothers Best Of (2010). In 2001, he performed at the Night of the Proms alongside James Brown, Joe Cocker, Shaggy, Cyndi Lauper, Zucherro, Gypsy Kings, Roger Hodgson and The Pointer Sisters. The same year he returned to Romania to perform an outdoor concert that was attended by 72,000 people and was broadcasted on PBS stations. In 2005, he won a Grammy Award for the album “Journey to the Sun” and in 2006, he started the Damian & Brothers Filarmonika Romanes Band, which with the purpose to change the stereotypes regarding Gypsy minority through music. This week, on November 12, Damian Draghici will be performing at the Palace Hall in Bucharest, at the “Jazz in the City” concert. Read more about the event in our recent article here.